If you’ve got an amithirst for fun, boy do we have a Bobby Dazzler of a mobile slots game for you! Introducing Wild Diamond Wins mobile slots, exclusive to mFortune Casino. This game is a real diamond in the rough, and you’ll be very glad you discovered it. This 15 win line game features all your favourite, traditional slots symbols with a modern twist. There are two mega multiplier mini-games, the full-screen reels take centre stage and a huge progressive Jackpot of diamond dosh is waiting to be won. Welcome, to Wild Diamond Wins. Wild Diamond Wins is 24-carat fun, and getting started with this mobile slots game couldn’t be easier! Firstly, it’s important to note that this game is fixed to 15 win lines. That means you’ll play the maximum number of lines with every spin. What you can change though, is your bet-per-line which you can adjust by tapping ‘Bet’ in the bottom left of the screen and using the ‘+’ and ‘-‘ icons to increase or decrease your bet-per-line. As you do, you’ll see that the amount displayed in the ‘Total Bet’ box adjust accordingly. Your total bet is your bet-per-line multiplied by the number of active win lines in play. For example, if you bet the minimum 1p a line across 15 win lines, your total bet would be 15p a spin. The maximum bet per line in Wild Diamond Wins is £5. This Bobby Dazzler of a mobile slots game also includes a handy ‘Auto Spin’ function for some extra sparkle. Press ‘Bet’ and select ‘Auto Spin’ to choose the number of spins you want the reels to spin through automatically along with a credit limit and maximum win amount. Tap the rotating wheel to start the auto spins and press ‘Stop’ to return to normal play at any time. Please note when in ‘Auto Spin’ mode, your spins will be locked at the bet-per-line of your previously set bet amount. Once you’re happy with your bet parameters, it’s time to see what ruby riches await you with Wild Diamond Wins! Tap the floating wheel and the reels will spin into action before they roll in and stop at random. We like to make our exclusive mobile slots games crystal clear and easy to play which is why the win lines in Wild Diamond Wins always pay from left to right. What symbols you need to line up to land a win, depends on what they are. You’ll need 2 or more of some, and 3+ of others. Tap the ‘Menu’ icon in the top left and tap ‘Paytable’ for full details. You might want to wear sunglasses, because any winning lines – and the prize amount – will shine bright like a diamond on the screen before automatically going into your credit. You’ll soon see that Wild Diamond Wins mobile slots is everyone’s best friend, when you realise there are some great wins up for grabs with each winning symbol combination awarding you a different multiplier of your bet-per-line. Just how bling that bonus is will depend on the combination of symbols on your active win lines, so be sure to check out the paytable for full details of all multipliers and winning combinations. We’re a pretty gem-erous mobile casino which is why if you win across more than one active win line with a single spin, we’ll add together all reel wins before we add them to your total credit. In the interest of clarity, we need to tell you that only the highest win on a single line will count. 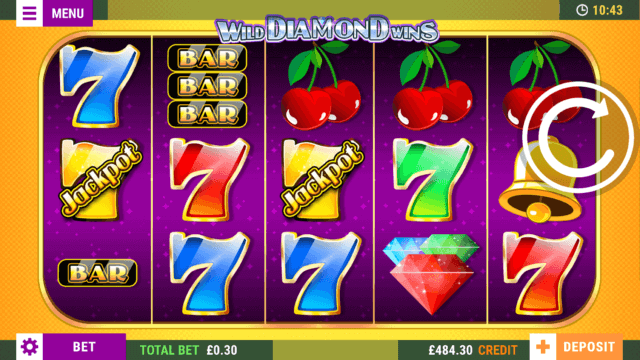 Wild Diamond Wins features all your favourite mobile slots symbols – the bell, bar and 7s all appear – but one you’ll really want to keep an eye out for is the Wild Diamond. You’ll be saying “Yes” if you see one on an active win line! That’s because Wild symbols can substitute for most others and potentially turn a losing spin into a winning one. For instance, if you line up two bar symbols and a Wild Diamond, you’ll win the multiplier you would have for 3 bars! We don’t want to ruby you up the wrong way, but we need to tell you that Wilds don’t substitute for Free Spins or Mini-Game symbols. You also can’t win the Wild Diamond Wins progressive Jackpot where a Wild replaces a Jackpot symbol. If you’re thinking: “There’s no way mFortune can top-az this mobile slots game!”, we’re about to as Wild Diamond Wins features not one but two multiplier mini-games: Diamond Wins and Big Spin. The Diamond Wins mini-game begins when you have 3 or more of the trio of diamond symbols anywhere on screen. This is a “Trail” style mini-game, where you spin the wheel and move along the course, with the aim of reaching the giant diamond at the end. Press the wheel to start it spinning and you’ll move that number of spaces along the trail collecting the multiplier of the space you land on. The mini-game ends when you land on a ‘Collect’ space or reach the end of the trail. You’ll to exit to the reels with the last multiplier you landed on before spinning the ‘Collect’. If you make it to the diamond, there’s a huge multiplier waiting! You’ll launch the Big Spin mini-game with 3 or more wheel symbols scattered anywhere on screen, and you’ll see a rainbow wheel filled with multipliers. Press the wheel to start it spinning and it will eventually come to a stop at random. If you land on a multiplier it’ll go into to your credit and you’ll exit to the main reels. Land on ‘Super Spin’, and all multipliers increase and you have a chance to win even bigger! If you land on a number here, you’ll win that multiplier amount and return to the main reels. Land on the ‘Golden Key’ and you’ll unlock the huge central multiplier win! Then, you’ll return to the main reels with your diamond dosh. They say the best things in life are free, which is why there’s the chance to win some free spins in Wild Diamond Wins! If you line up 3, 4, or 5 of the Free Spins symbols ANYWHERE on screen, the reels will glow golden and you’ll receive 8, 12, or 20 respective free spins. Any free spins awarded will lock at your previous bet-per-line, but as we’re paying for this one you won’t spend a penny! Wild Diamond Wins mobile slots is a real Bobby Dazzler, with some seriously sparkly prizes up for grabs! Why don’t you download this mFortune Casino exclusive today, and see what you win? New to mFortune? Register for an account today and you’ll receive a free welcome bonus of £5* – with no deposit required! Then, when you do deposit, we’ll match your first one 100% up to £100**! Sign up today, and try our exclusive slots games for yourself. *18+. £5 welcome bonus to new players only. No deposit required. Terms and conditions apply. **18+. New players only. 100% deposit match of first deposit, up to £100 awarded as bonus credit. Bonus credit is not withdrawable. Terms and conditions apply. The occurrence of 5 (five) “JACKPOT” symbols on an active win line awards a progressive Jackpot. The progressive Jackpot is available on any bet, with 0.005% of the bet being added to the progressive pot. There is no hidden reserve pot. When the Jackpot is won, it is reset and begins to rise again. Simultaneous wins can occur, if another player wins the progressive Jackpot then a notification to this effect would occur BEFORE the current player was awarded the Jackpot. The game Jackpot seed value is £2000. The Jackpot is individual for this game, it is not shared with any other games. In the event of a communication error after a progressive win result has been determined and before it has been displayed on screen, the win amount will automatically be transferred to the player’s account. While the game is live, the Jackpots cannot be terminated. Wild Diamond Wins mobile slots has a theoretical return to player of 94.43%. This is based on long term playback. System malfunctions void all payments. Monies are staked in the following order: winnings, player deposits, bonus credit. mFortune general terms and conditions apply. Do you want to deposit ?